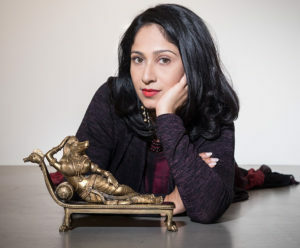 Siri Devi Khandavilli works across painting, performance, video, and installation to create visual art that is rooted in traditional Indian techniques and yet transcends cultural specificity to hint at larger commentaries about the materialistic nature of the present. She is best known for her cheeky Chola-like bronze sculptures that evoke traditional idols of Hindu female deities, with a poodle’s head in place of a goddess’s. Other notable works include Eat (2009), a looped video critiquing mindless consumption, and Lucky Lakshmi Dollar Bill (2010), a conceptual work created from US currency that emphasizes the multiple connotations of money across cultures. Seen as a whole, Khandavilli’s diverse body of work is centered on the notion of desire and seeks to answer the question of what is it that moves people and the world. © 2019 Siri Khandavilli All Rights Reserved.